I spent from the end of September until Saturday 4th November without a drop of alcohol. When you tell people this the first thing they ask is, ‘do you feel any better for it?’ The honest answer is that I’m not sure, because I think the autumn weather (wet and windy), and preparing myself for the clock change at the end of October…do not bode well for me. I like warm sunshine and dry fields and whilst I love sitting by the fire in the dark evenings, reading a book and watching a film on the telly I find myself feeling ‘wintry’ as in not inspired to do very much but hibernate. Is that a good way to feel? I think not. Something has to be done about it. I love the wood burning stove…a necessity for hibernating. Get out and about, visit Bridport, attend some writing workshops, go to the library, walk the dog and don’t succumb to the winter blues. So that’s what I’m planning and have already implemented as far as I can. First workshop attended was at Waterstones, in Dorchester. Organised by the Dorset Writers’ Network and led by Rosanna Ley. A group of twelve writers of varying experience, spent two hours listening, creating and having fun on the subject of ‘Sense of Place’. Making sure that your writing gets a true picture of where your story is set and bringing reality to the internal and external scenes that you write. I came away feeling inspired and keen to get on with at least one of my half-written novels, so that has to be good. I began reading through a manuscript this morning…or should I say trudging…think I need to make some drastic changes! We are members of the Bridport Film Society (in fact I’m on the committee, not wanting to boast or anything) so every other Tuesday from now until March we can go and see an International film at the Bridport Arts Centre. This week is is Julietta ‘an exquisite study of a mother-daughter relationship tested though trying times…’ Sounds interesting eh? It’s a Spanish film with subtitles. I know some people hate subtitles but I love them because I love watching foreign films and I hate it when they’re dubbed. 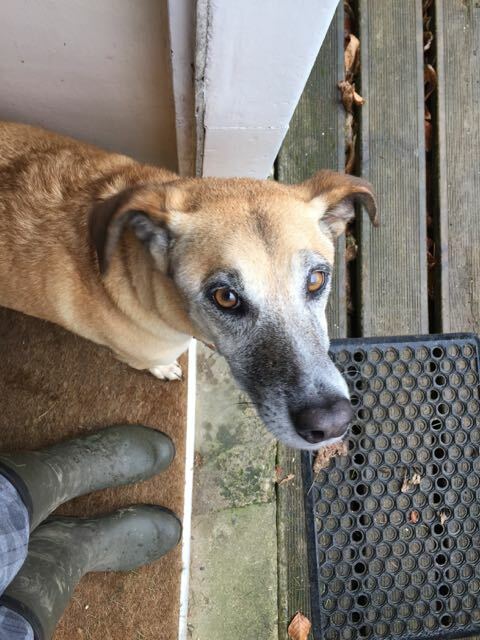 Walking the dog has become something of a difficulty because of the muddy fields when it’s necessary to wear Wellington boots. These are hard to step out in and generally I end up with back ache at the end of even a half-hour walk. My decision is to put on the Wellies in the morning, take the dog to the nearest field, let her run for 5k while I walk for 1.5k then bring her home. In the afternoon I will put on an ordinary pair of lightweight walking shoes, take to the roads and do another 3k. This is my plan but we all know about my plans and how they can change depending on my mood and the weather. Going back to the alcohol thing, when I did drink that half glass of red wine on Saturday 4th November, it was Ciu Ciu Gotico (if you’re interested) which, usually I adore…I didn’t really enjoy it on this occasion so the other 5 bottles that I brought back from Italy will probably sit on the rack for some time to come. I have found a couple of reasonable alcohol free or de-alcoholised wines and I’m going to stick to them for a while. Although a gin and tonic does sound rather tempting at around 6pm in front of the wood burning stove while I contemplate my next day’s writing challenge. January, February…soon be March…soon be Easter! Getting a bit behind with my posts this year and it’s only February! It’s amazing how time flies when you’re doing nothing. Well, doing nothing isn’t strictly true, I am trying to write a novel and now wondering whatever made me start, but start I have and finish I must. It does take up a lot of my writing time though. 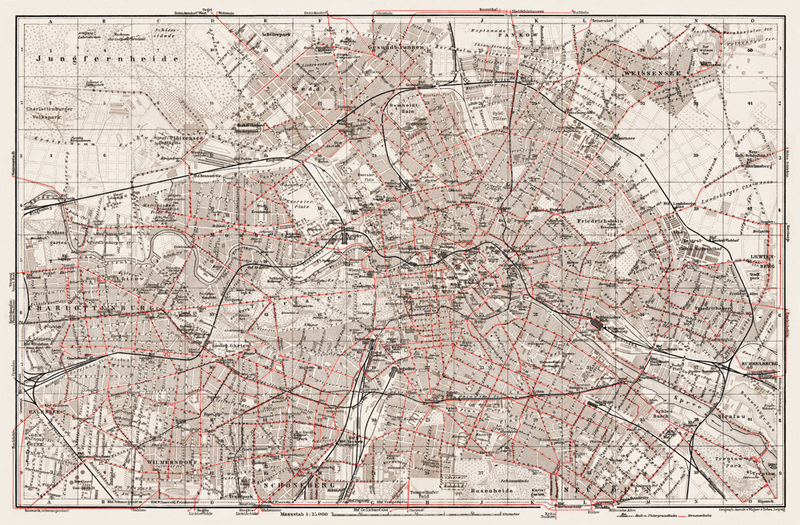 It’s proving to be much harder than I thought, mainly because I’ve decided to start the story in Berlin at the beginning of 1914 and this means lots of research. So every five sentences or so I have to look something up. ‘Why not look it all up before you start,’ I hear you say. Well, it’s not that easy because things pop up that you don’t expect to pop up and then you have to check out things and change things…It’s a learning curve. The Man is quite helpful, he does have a great deal of historical facts and information stored in his head which has come in pretty handy for me lately. But, back to Italy and Le Marche. 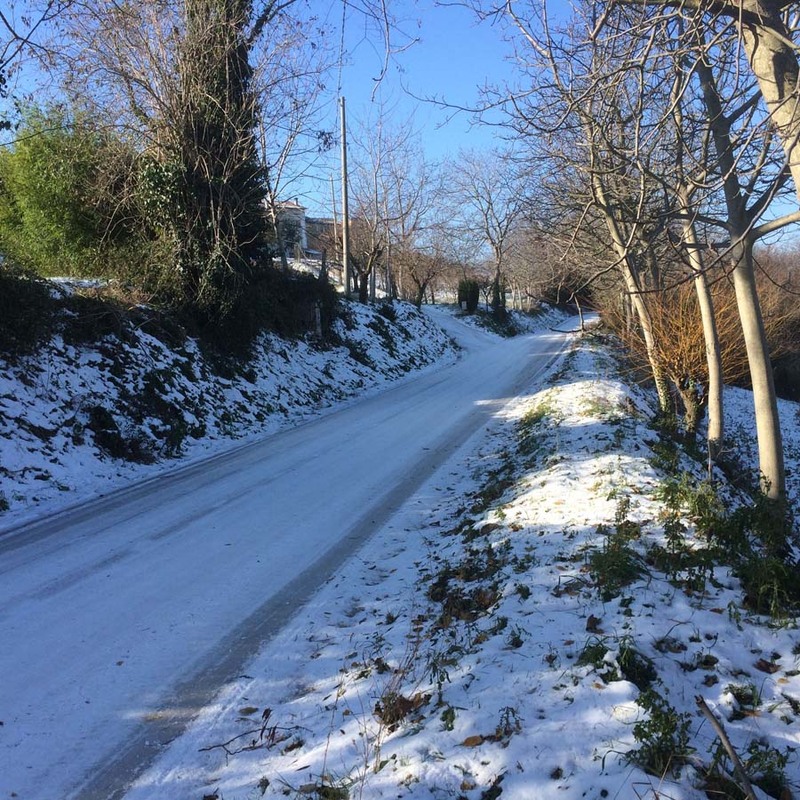 In January we went from this…. We were welcomed home by the animals…. 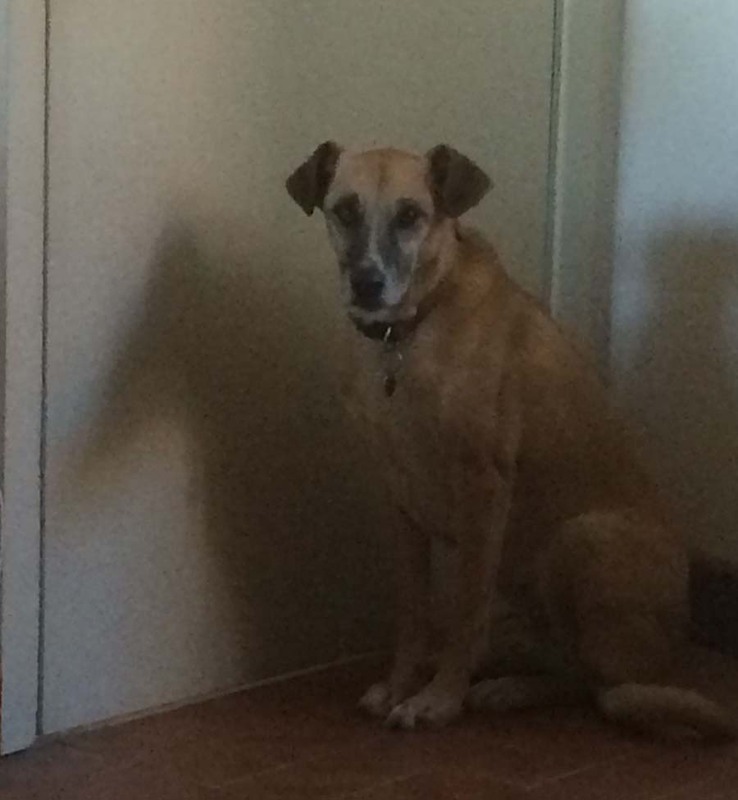 Jpeg now always waiting by the door in case there’s a chance we might leave without her and pop off to Thailand again. 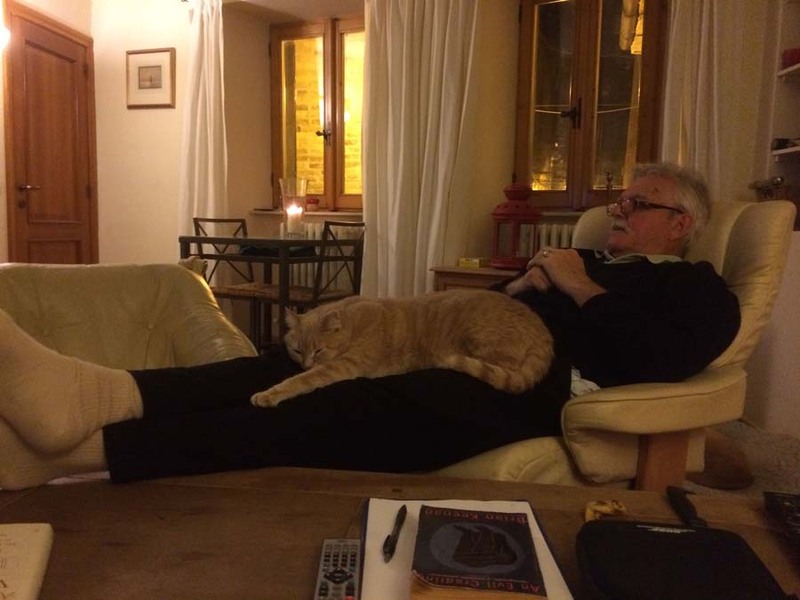 Mickey the cat making himself comfortable… he missed The Man I think. Of course we have more than just animals in our family and my son Will joined us for a few days at the beginning of this year. 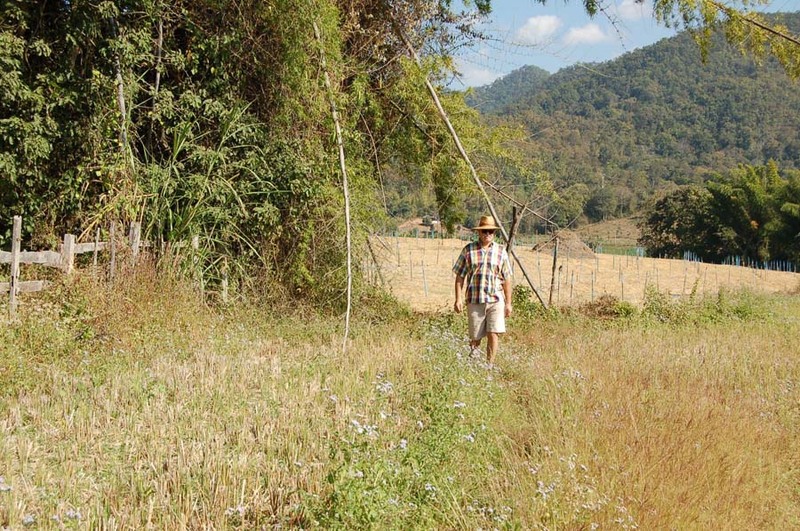 We took him for a day out…as you do with your kids. We first went to Porto Recanati, which was a little bit of a disappointment. Like any seaside resort, out of season it lacked a certain liveliness and colour. The restaurants were almost all closed and the sea front (lungomare) was cheerless. But we did find a place serving a 2 course lunch with wine for about 12 euro a head. Pasta followed by fried fish. I wish I could remember the name of the restaurant but I can’t… and it appears I didn’t take a photo…perhaps Will did. After lunch we went to Castelfidardo to the accordion museum, which was very interesting. I had thought that it would be a little boring but there were show cases housing many different types and styles of accordion. Paolo Soprani, a farmhand from Castelfidardo, early in the 1860s began what was the first industrial production of accordions and a model of his workshop is in the museum and a video showing the history of the instrument and clips of bands, orchestras and even the Beatles playing the accordion in many different styles of music. Wills, who plays himself, was able to give a quick demo while in the museum, interesting because apparently he plays it upside down, but it didn’t seem to make any difference to the tune. 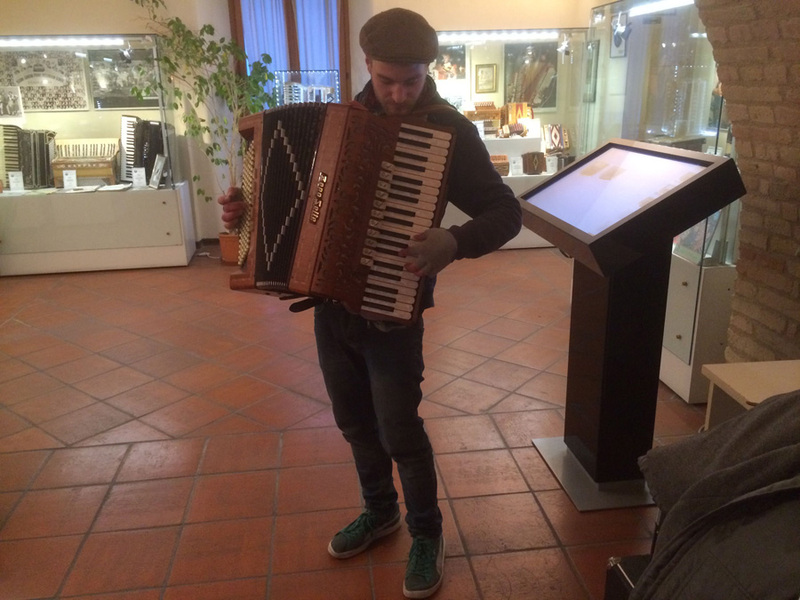 After the museum we went to a shop selling accordion…not cheap. Castefidardo is apparently THE place to buy an accordion if you are a professional player or know your stuff. People come from all over the world to buy in this small town and probably in the very shop we were in – Victoria. We didn’t buy one, not on this occasion anyway. 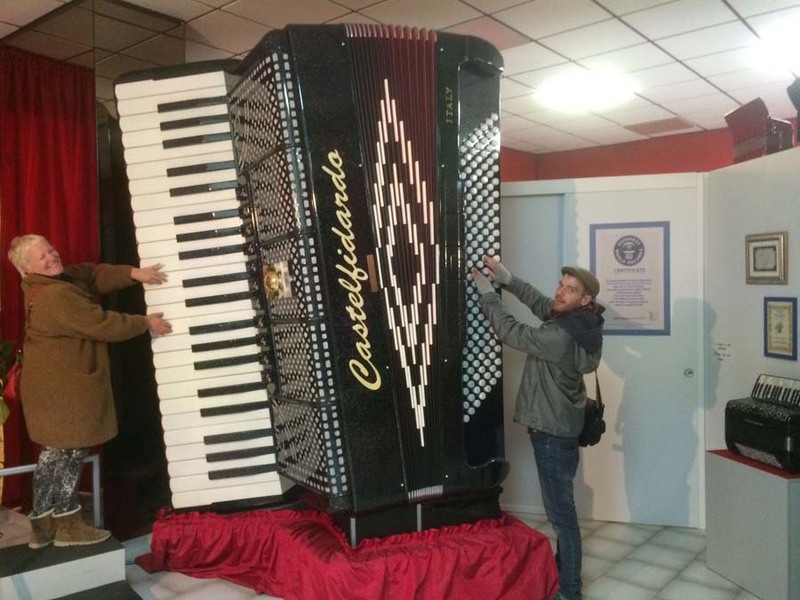 We did however, get the change to play the biggest accordion in the world – well we posed for a photo anyway. We enjoyed ourselves so much that we decided, The Man and I, that we would go for an outing once each week… get out and about more, you know what I mean? Needless to say that didn’t happen but we did manage lunch in January in Smerillo in a fab restaurant called Le Logge. 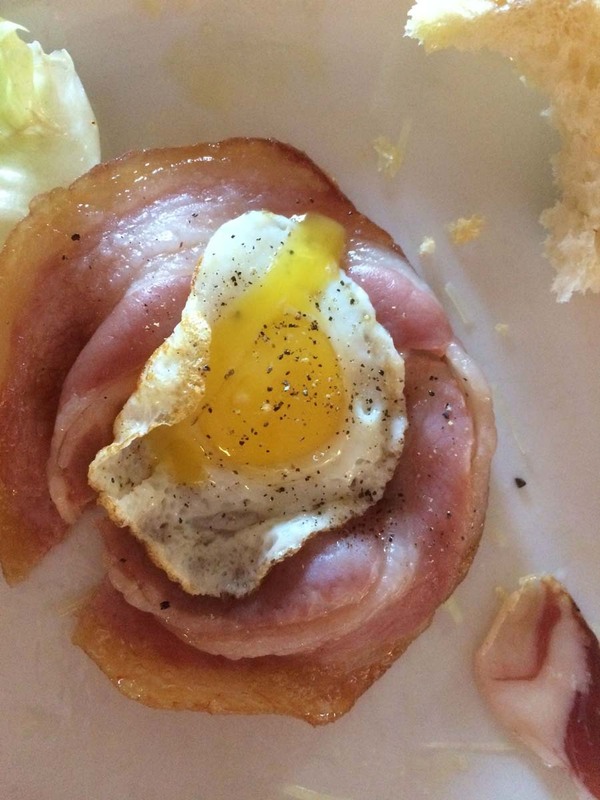 We dined in the typical Marche way, several courses including an unusual one of bacon and egg. wine, coffee and vino cotto, plus a drop of mistra (very strong aniseed liqueur locally distilled) served in an edible chocolate cup! Fantastic. We’ll be going there again in the summer when we’ll be able to sit outside. 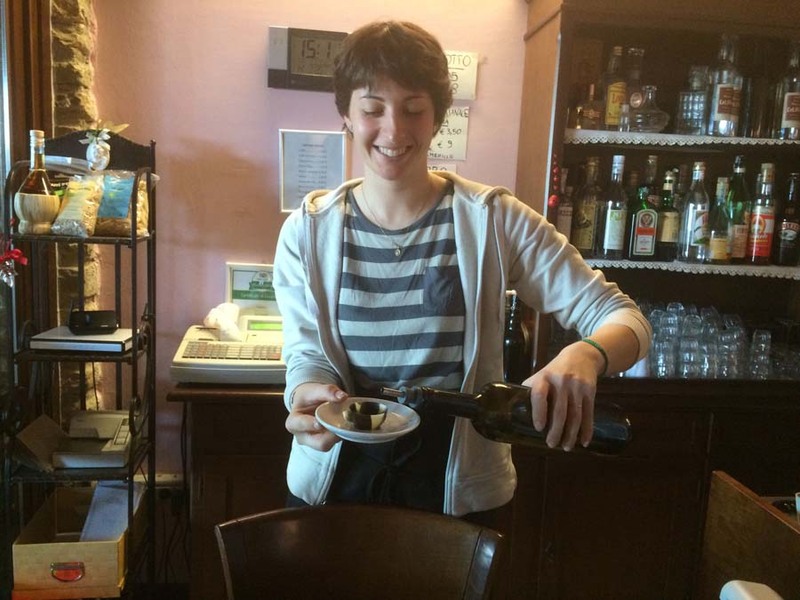 Lovely waitress pouring my mistra into the chocolate cup! 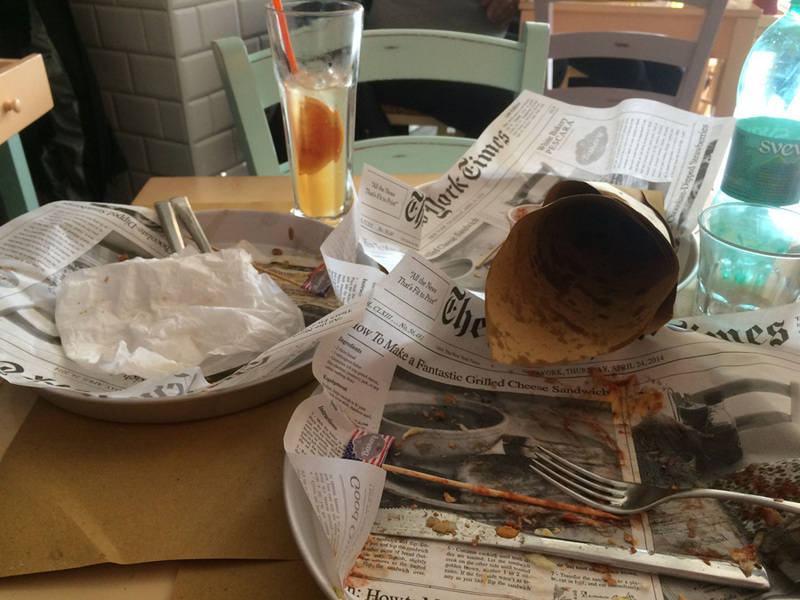 Since then we’ve been pathetic in attempting our day out a week – well I AM writing a novel…we did manage to get to the White Bakery in San Benedetto last Friday (13th) to enjoy burger and chips. Grand stuff. We didn’t enjoy that much! 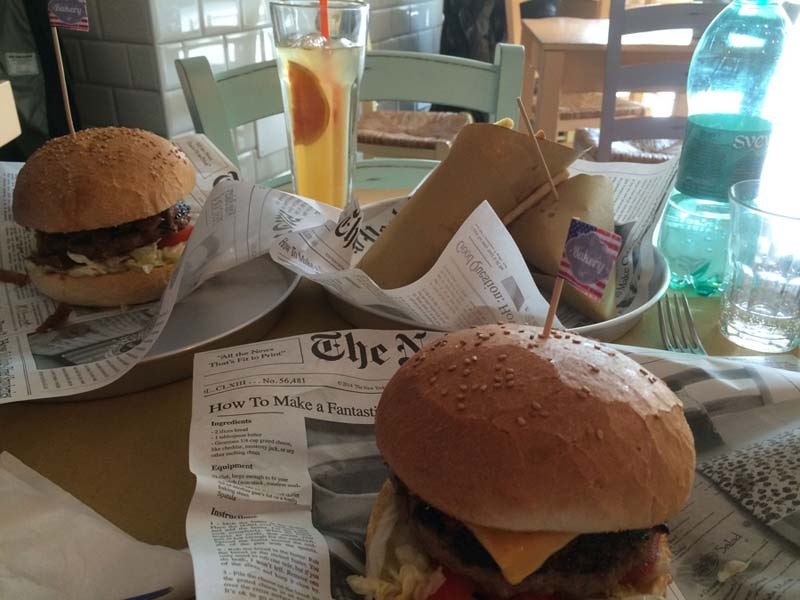 Looking forward to some warmer weather in March and our next outing, which will be to Jesi….watch this space.